If you bought and sold your crypto with U.S. dollars, it’s pretty easy to calculate your cost basis. But the majority of cryptocurrencies don’t trade against the dollar. They’re bought and sold with other cryptocurrencies, primarily Bitcoin and Ethereum. So to figure out what you paid, you need to find out the U.S. dollar value at the moment of trade of the other crypto you used in the transaction. Some crypto investors believe that such “crypto to crypto” transactions, because they do not involve the U.S. dollar, are not taxable events. But the IRS says otherwise. 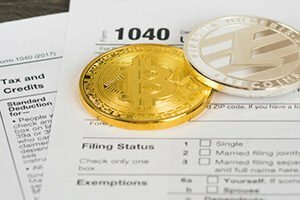 In fact, according to the 2014 IRS guidance, any transaction made with a cryptocurrency is a taxable event. That includes crypto obtained through mining, as well as crypto obtained from “hard forks,” such as the Bitcoin Cash fork from Bitcoin in 2017. And most importantly, it includes using crypto to buy something – even something as small as a beer or a cup of coffee. For any crypto enthusiast who makes frequent transactions, be it with merchants or other crypto fans, this means calculating capital gains and losses on every transaction. It’s no wonder few people even try to comply with this. That’s why many have called for crypto to be given what’s known as a de minimis exception. That means transactions below a certain amount, such as $600, would be exempt from taxes. In fact, over the past few years, several bills have been introduced in Congress to create a de minimis exception for crypto. While the Token Taxonomy Act died with the end of the last session of Congress (all pending bills die when a session ends), the bill’s sponsors – Rep. Warren Davidson (R-OH) and Rep. Darren Soto (D-FL) – have suggested they will reintroduce it to the current session, perhaps as soon as this week. But remember, this is Washington. It will be a long time before this bill is even brought to the floor for a vote. Still, it’s progress. Stay hopeful, crypto fans. Steven Seagal Windmills and Bitcoiin?!? !